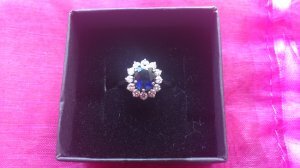 Stunning Engagement / Ladies Dress Ring with oval centre Navy Blue Sapphire 1.10ct, & 12 small Diamonds 0.36ct surrounding it. All claw set. Ring is 18ct yellow Gold, that has been white rhodium plated. One of a kind. Custom Designed. Perfect Condition. Valuation Certificate available on request. Ring Value: R18 500. Asking price: R14 800 or ONCO.